From the highest-level athlete to a fan of a really good team, there’s nothing quite so shocking as the upset loss that ends a season with high expectations, expectations now crashed to earth. It’s even worse when it means the end of a great career, that beloved superstar that walks off the field for the last time, never having quite made it to the Promised Land. 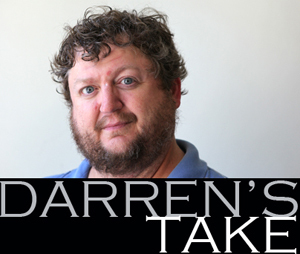 After a second straight year of a shocking loss in an NCAA Super Regional, this time to Washington (it was LSU last time around), the MU softball program and its fans now look to life without Chelsea. Chelsea Thomas, with all those All-American awards and Pitcher of the Year in two conferences, is gone for good. So are several other top players including some that are darn near irreplaceable. We lose Nicole Hudson, whose move from the field to the pitching circle didn’t keep her from being one of the team’s most reliable hitters. Farewell Jenna Marston, who became a terrific catcher and also contributed a lot to the offense. Lindsey Muller, Princess Krebs, and Rachel Hay all have played their final game in the black and gold. 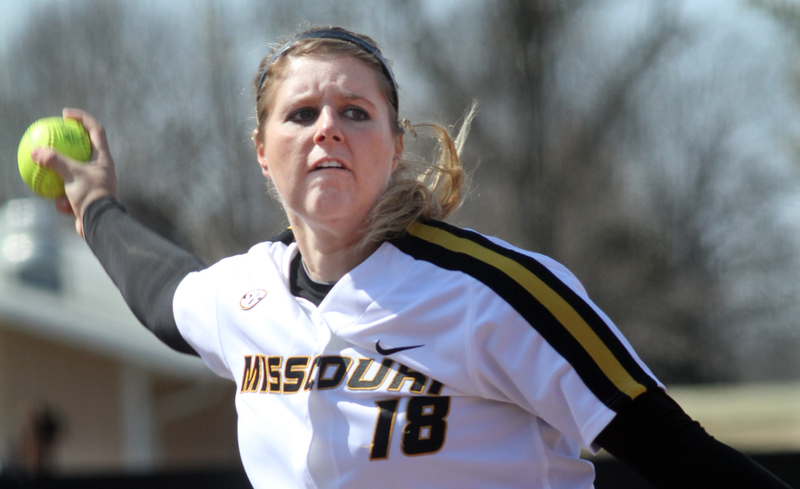 Chelsea Thomas is arguably Missouri’s historically best pitcher, ranking at or near the top in several categories. But she doesn’t need to throw a perfect game to be effective. 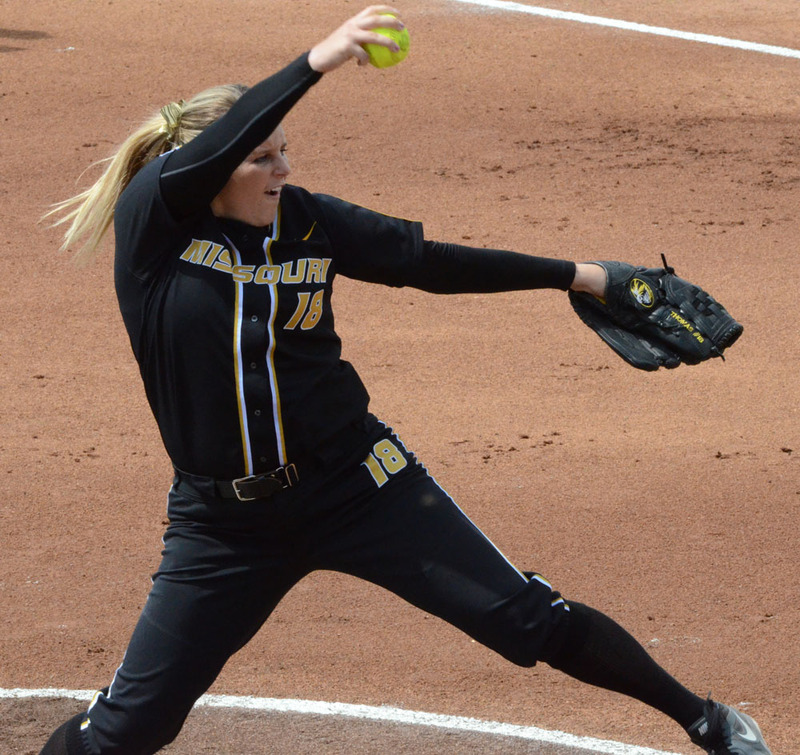 Though the redshirt senior has thrown 11 no-hitters in her Missouri career (three of those were perfect games) she dominates in nearly every game she plays. Thomas’ win-loss record as of May 11 is 111-29 with 1,147 strikeouts in 897 innings pitched. She is averaging 7.45 K’s per game. Nicole Hudson (8) is congratulated by teammates Mackenzie Sykes (4) and Jenna Marston (26) after scoring. Missouri beat Hofstra 5-0 in the second game Sunday, May 19, 2013, to win the regional tournament at University Field in Columbia, Mo. 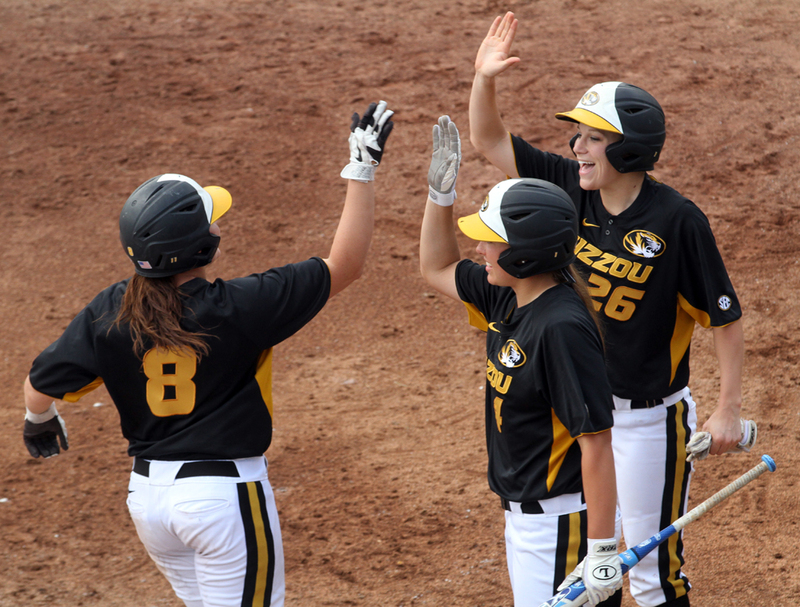 Missouri needed both games on Sunday to defeat Olivia Galati and the Hofstra Pride. With Nicole Hudson in the pitching circle, the Tigers were unable to score a run, losing 10-0 in five innings. Missouri managed just four hits while Hofstra had nine. Chelsea Thomas pitches with Hofstra’s lead-off hitter Chloe Fitzgerald watching from second base. Thomas was able to hold on for the shut-out victory. Even though the Hofstra Pride jumped on Missouri pitcher Chelsea Thomas from the very first batter, Thomas was able to get timely strike outs to earn the 1-0 shutout in the Columbia Regional Saturday. 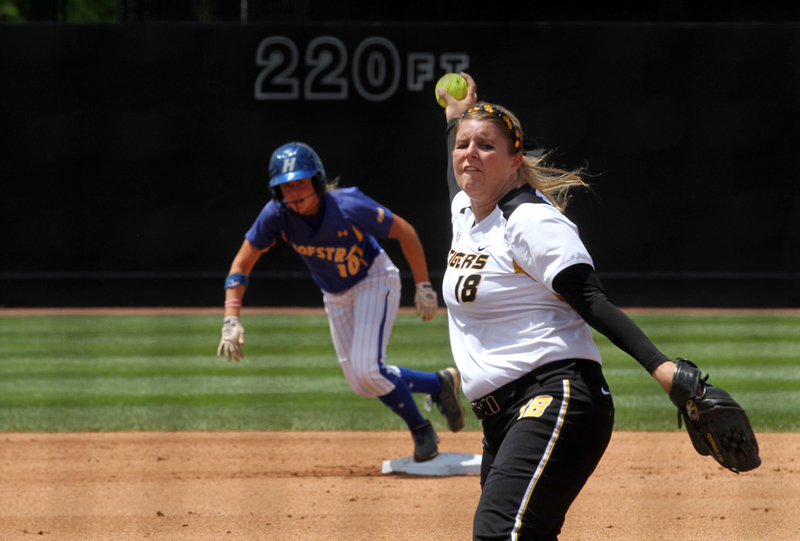 Missouri pitcher Chelsea Thomas and catcher Jenna Marston were named Southeastern Conference Pitcher of the Year and Scholar-Athlete of the Year, respectively, as voted by SEC head coaches. Thomas and Marston also earned First Team All-SEC honors and Thomas was named to the SEC All-Defensive Team. Thomas led Missouri with a 13-4 record with a 1.70 ERA in league play, putting her first and second in the SEC in those categories respectively. She had a league-best 19 conference starts and held SEC opponents to a .176 batting average. In her career, Thomas has been elected Pitcher of the Year for her conference three times, First Team All Conference three times and All Defense once. Missouri pitcher Chelsea Thomas delivers a pitch on April 13, 2013. The Southeastern Conference named Missouri senior Chelsea Thomas the SEC Pitcher of the Week for the fifth time this season on Monday afternoon. The award gives Thomas a tie with former Tennessee pitcher Monica Abbott for the most SEC Pitcher of the Week recognitions in one season. Abbott achieved the feat in 2005. The award gives Thomas 17 Pitcher of the Week awards for her career. Thomas pitched her 11th complete game no-hitter of her career in a 2-0 win over No. 4 Tennessee. It was the first time Tennessee had been no-hit since 2002. Thomas totaled seven strikeouts, three walks and one hit-by-pitch and improved her season record to 20-4. The win gives her 13 conference wins this season, the most in the SEC. Thomas will take the circle again at the SEC Tournament against No. 22 Arkansas on Thursday at 3 p.m. at John Cropp Stadium in Lexington, Ky.
Mizzou’s Chelsea Thomas recognized for community service. Pitcher Chelsea Thomas is already a two-time All-American and an Academic All-District honoree. Now, she is also a member of the Southeastern Conference’s Community Service team. The SEC announced the annual team that recognizes athletes who give back to their community in superior service efforts. One player from each softball team in the conference is selected to be part of the team, one of 21 community service teams the conference sponsors. Thomas was recognized for planning the Mizzou Moves pilot program, which teaches elementary school students in the Columbia area about exercise and healthy eating. In addition, she teaches Missouri’s Court Appointed Special Advocates clinics, showing softball and baseball skills to attendees. She has also spoken at the Tiger Village Retirement Home and organized the softball team’s annual “Christmas Adopt-A-Family” gifts. Thomas is expected to take the field again on Thursday in the SEC Tournament. No. 11 Missouri will face No. 22 Arkansas at 3 p.m. at John Cropp Stadium in Lexington, Ky.
With 1,540 people packed into University Field and many more watching the nationally-televised game, Chelsea Thomas pitched a no-hitter to lead No. 11 Missouri to a 2-0 victory in game one against No. 4 Tennessee. “It’s pretty crazy. It was a really fun night. I’ll remember this night for a while,” Thomas said. The game was her first solo no-hitter of the season and the eleventh of her career. The caliber of competition makes the performance even more special according to coach Ehren Earleywine. No. 11 Missouri softball has not only been good on the field but also in the classroom this season. On Friday, senior catcher Jenna Marston, junior outfielder Mackenzie Sykes and senior pitcher Chelsea Thomas were selected for the Capital One Academic All-District 6 team. The College Sports Information Directors of America select players based on athletic and academic performance. An industrial engineering major, Marston has a 3.99 grade point average. She also ranks second in the Southeastern Conference in doubles (7) and on-base percentage (.500) this season. Marston has earned Academic All-District three times in her career and was named First Team Academic All-American last season. She was selected as a First Team Academic All-Big 12 in 2011 and 2012. A sports management major, Sykes has a 3.92 GPA and is batting a career-best .333 this season. She also has hit seven home runs this season after hitting just four in her first two season. Sykes earned First Team Academic All-Big in 2012. After obtaining an undergraduate degree in biology, Thomas is in graduate school for positive coaching and has a 3.37 GPA. She leads the SEC in earned run average at 1.31 and opponent batting average at .162. Thomas earned Second Team Academic All-American in 2012 and has been Academic All-District twice. Thomas was First Team Academic All-Big 12 three times from 2010 to 2012. First Team Academic All‐District honorees advance to the Capital One Academic All‐America Team ballot, from which first, second and third team All‐America honorees will be selected later this month. Friday’s game against No. 4 Tennessee was postponed due to adverse weather. Saturday’s game scheduled for 6:30 p.m. and Sunday’s at noon at University Field are expected to be played.